The SQ-512 is an amplified full-spectrum quantum sensor with a 0 to 2.5 V output. The sensor incorporates a blue-enhanced silicon photodiode and custom optical filters with a rugged, self-cleaning sensor housing design, anodized aluminum body with acrylic diffuser. Typical applications include PPFD measurement over plant canopies in outdoor environments, greenhouses, and growth chambers, and reflected or under-canopy (transmitted) PPFD measurements in the same environments. Quantum sensors are also used to measure PAR/PPFD in aquatic environments, including salt water aquariums where corals are grown. Sensor includes IP68 marine-grade stainless-steel cable connector 30 cm from head to simplify sensor removal and replacement for maintenance and recalibration. How is the SQ-500 differentfrom previous Apogee quantum sensors? 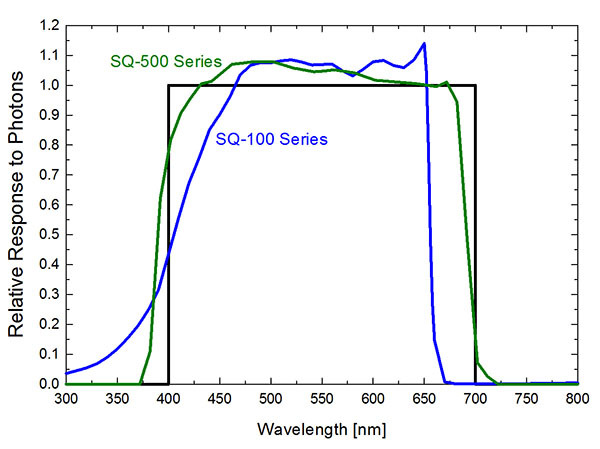 The SQ-500 is a full spectrum quantum sensor with a spectral range of 389 to 692 nm ± 5 nm, which can be seen in the graph below. This improved spectral respose increases the acuracy of LED measurements. Where is the SQ-500 used? The SQ-500 is used to measure incoming PPFD measurements in outdoor environments, greenhouses, growth chambers, and aquariums. Full-spectrum quantum sensor used to measure the PPFD output of grow lights to create PAR intensity maps of a grow area. The PAR intensity map is then used to determine how far the grow lights should be positioned from the crop for maximum yield.